You all are the most awesome Insiders ever! Here in the Feedback Hub team, we love feedback, we love hearing from you, and we love being able to clearly understand what you want us to go after to make your experience better in the app. One thing we heard is that you want us to reduce the duplicate feedback you see in the app, and I'm happy to share that we've just launched a feature to address it! 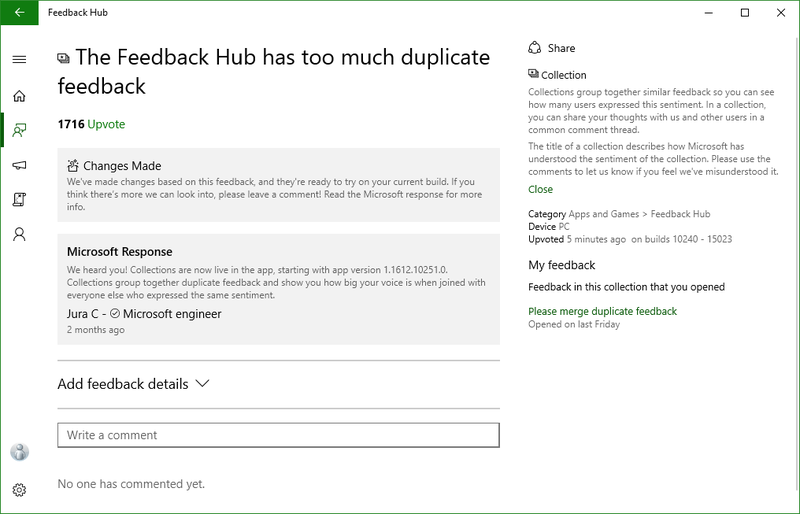 There has been duplicate feedback since the early days of the Insider program, and the engineering team has had a behind-the-scenes way to manage the duplicates as we take action on your feedback. We've mentioned it before - the mechanism is called a feedback parent - it's a single item in our internal systems that brings together many individual pieces of feedback that all refer to the same thing. The feedback parent sums up all your upvotes on all the feedbacks and the diagnostic information we've received, and allows us to respond back to everyone who had that problem/suggestion all at once. By looking not just at individual feedback but at feedback parents, we're able to see how big your collective voices are about your feedback across everything you've submitted and upvoted. Now that we've figured out how to use feedback parents effectively internally, we want to be able to reflect back to you some of the work we've done to group and consolidate similar feedback. I'm happy to introduce a new feature called Collections. A collection is a user-facing representation of a feedback parent, so you'll see a single item representing a sentiment that brings together all the voices who expressed that sentiment in one place. All of your individual voices will be amplified when your feedback and upvotes are joined together into collections, and you'll be able to see just how big your voice can become. Same as with individual feedback, you'll be able to upvote collections, upload screenshots to show the engineering team a problem you're seeing or give suggestions for new UX, and comment in a single thread with other users who care about the feedback. · Collections are identified with an icon next to their title, so you can easily tell them apart from individual feedback. · The collection title is written by a Community Champ to summarize all of the feedback in the Collection. This is a way for us to describe how we've understood your feedback, and we hope you'll let us know in the comments if we've gotten it wrong. International users will see a machine translated title and a link to see the original English title for those who can also read English and prefer to see the original. · If you created feedback that's part of the collection, you'll see it in a section on the right of the feedback details titled My Feedback. From here you can get to the details page for your feedback. The individual feedback will be read-only since all new activity will happen on the collection, but you'll still be able to see any comments or other activity on your original individual feedback. · The upvote count you see on a collection totals the upvotes that are represented by all the duplicate feedbacks that have been added to the collection. For collections that include your feedback or upvotes, this lets you see how big your voice has become by being added to a collection. · Collections will be shown to non-English speaking users viewing Feedback Hub in Dutch, French, German, Italian, Japanese, Polish, Portuguese (Brazil), Russian, Simplified Chinese, and Spanish. Users those languages will see a machine translated title for the collection, and a link to see the original English title. Collections are live in the app now, with app version 1.1612.10251.0. Once you have the latest app, you'll see that there's a set of collections already published for some of the biggest feedback parents we have. Those first collections reduce more than 130K duplicate feedback into fewer than 1000 collections. More will be published over time as you send new feedback. Here's our ask to you: if you see a feedback or a collection that describes your feedback please upvote it rather than creating new feedback. You'll be saving the team time adding feedback to collections, which will help us get to work on product changes based on your feedback faster.